Need to part ways with an employee? Termination is a process you want to get right to avoid a pesky unfair dismissal claim from a past employee. Luckily, enableHR has an entire module dedicated to correctly managing termination processes. 1. Go to the 'Employee Management' module, which is located in the panel on the left hand side of the screen. 2. Click on the 'Termination' workflow tab. 3. Depending on the need, select the relevant termination checklist. 4. You will be prompted to 'commence' the checklist if you are seeking to commence a new HR process with this employee. You can however complete checklists over the course of a few days/months and can utilise the 'resume' checklist option to return to on-going checklists that haven't yet been completed. 5. If you are commencing a new checklist, you will need to select the relevant employee record. You will be prompted to input the details of the employee if you haven't already entered these into the enableHR system. 6. Answer all questions listed in the checklist. All actions, documentation and notes captured in the process of completing the checklist will automatically be electronically stored against the employee's worker record within enableHR. 7. At various stages throughout the checklist, you may need to write a letter to your employee. This could be in relation to requesting a meeting or issuing a termination letter for example. It is important that you use enableHR's letter templates as they have been prepared by specialist employment lawyers to ensure that they are compliant with today's workplace laws. 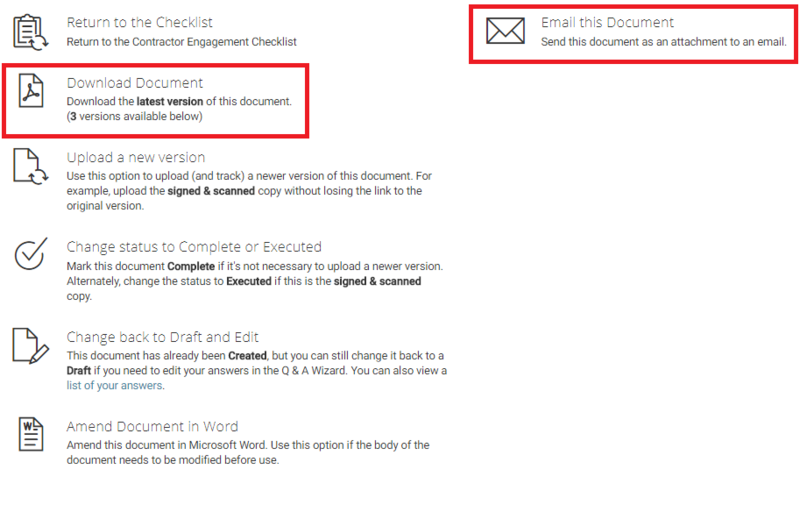 To generate letters, select the 'Create' button at the relevant step in the checklist and then the 'Create a new document' button. 8. You will then be prompted to answer a series of questions. All answers input into enableHR will automatically be populated into the letter once this process is complete. The letter will also automatically source all relevant details about the employee stored against their worker record and input them into the letter (such as name, address etc). 9. Once all answers have been completed, you can 'Preview' the letter or can simply select 'Next' in order to return to the checklist so that you can complete the remaining steps. 10. The letter is automatically stored against the checklist and the employee's worker record. You can 'Download' or 'Email' the letter depending on your preferred communication methods. IMPORTANT: Once you have terminated the employee, you will need to ensure that their worker record is archived by updating the record's status to 'terminated'. Follow these instructions to complete the process.